One of my favorite activities in a theater is listening to my fellow audience members as I head toward the nearest exit. As an occasional critic, I’ve found that listening to the audience’s reaction to a film is just as important as my own experience. Sometimes you love a film, or utterly despise it, but walking out of that dark room and hearing someone’s else’s response can be a real eye opener. What surprised me so much, as I eavesdropped on the double date in front of me, was that no one seemed to have any idea what the hell was going on in Mother! I can’t say I really blame those viewers, though a quick Google search of Darren Aronofsky should’ve given anyone an idea of what they might be in for. Clearly, any “horror” film made by the director of Pi, The Wrestler, The Fountain, Black Swan, Noah and Requiem for a Dream, would be all kinds of insane, just not insane in the way of typical horror tropes. Truth be told, the film probably should’ve been quietly billed as a sort of auteur, film-buff kind of movie. Then again, if you can make a movie like Noah, and walk away unscathed, I suppose a film like this is child’s play. 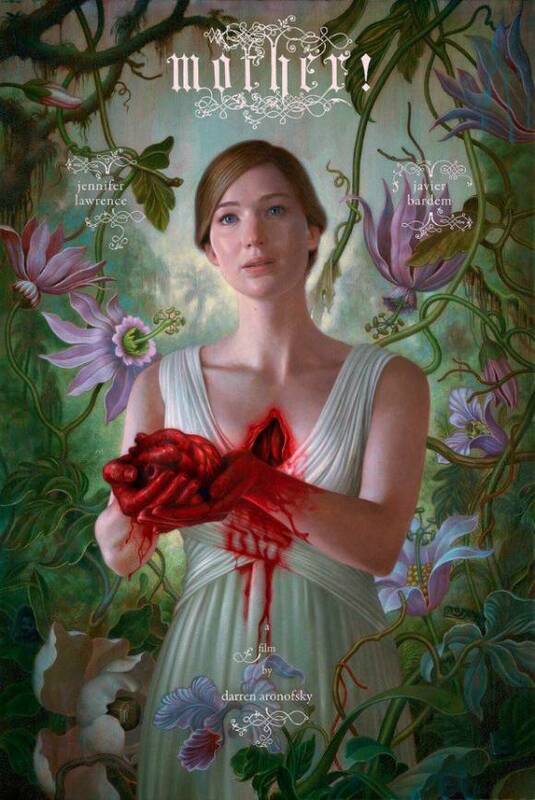 Nevertheless, instead of a typical review and criticism, I’m going to spend some time unpacking the surprisingly layered allegory that is Mother! Comparisons between Mother! and Rosemary’s Baby, while mostly being about billing the movie to audiences, is not totally unfounded. The similarities rest less in the horror aspect, however, and are brought to bear more easily in the context of abuse and power. They are both young, vulnerable women, continually isolated and treated like things to be used or even revered, but revered as things, not as full persons. Jennifer Lawrence, as the character of Mother, is ignored in her own home by strangers, and often respected only as Him’s (that’s Javier Bardem) inspiration. In the context of a relationship, what we see is that Mother has no real power of her own. She is helpless, and yet always giving more of herself away. The idea of a mother figure giving up her body and her home to strangers suddenly appearing and ripping the very pipes from the walls seems inexplicable and silly, and it’s supposed to. The symbolism here is not apparent at first, but then blindingly obvious. If Mother Earth were anthropomorphized, what might she think of these strangers wandering around her home, that she created, ripping metal out of the earth? I mention relationships and the environment first, because honestly, if you didn’t catch the many religious references in Mother! I really doubt you have the patience to have kept reading to this point. It should be fairly obvious, after a little thought, that Javier Bardem’s Him is a traditionally Western God figure, just as Mother is Mother Earth. At first, the solitary home is a paradise, a veritable Eden, but as Man (Ed Harris) and then Woman (MiIchelle Pfeiffer) show up, every thing gets a little wonky. We even see a classic Cain and Abel story play out as their sons show up, and someone winds up dead. Later in the story, we find a flood that washes some unruly guests out of the house. We find frogs and flies, and various other plagues in the house. Things get really nuts when Mother gives birth to a child, a child that Him recklessly insists on displaying to “the world.” In a subtle turn of symbolism, Mother goes from Mother Earth to Mother Mary, as the little baby is, of course, slaughtered. By this point in the movie, if you’ve begun to wonder where the horror element is, it’s right here. Mother rushes to the aid of her child, only to find a strange mass of people consuming her baby in a parody of Christian Communion. Oh, and then they beat the hell out of her in a genuinely disturbing scene. The exploration of the relationships between artists and their creations is at the heart of this film, as it is with many of Aronofsky’s works. Where Black Swan explored the lengths an artist will go for their art, or Requiem for a Dream treats art as a kind of addiction, Mother! focuses on the male ego, on the desire of an artist to be adored for their creations, and of the experiences of loving such a person. This idea is the key to all the other metaphors in the movie. We can think of God as an example of male power, or the evils that come into the world when we raise that power above mindfulness of our environment. We can turn this on its head, too, and see the audacity and self-reflection inherent in a film, directed by a famous artist, that compares God and the history of humanity with that of the domestic life of a famous poet. Speaking of the male ego, doesn’t it seem a little weird that Aronofsky wrote and directed a film about artists abusing their partners, and then proceeds to date the protagonist? How did that play out? It should be noted that no allegory or metaphor is ever perfect. At some point, the analogies break down, and no one has to read into all of the symbolism or should feel that everything will fit neatly into place. To be sure, Mother! isn’t a horror film, per se, but my God will it put some horrifying and preoccupying ideas in your head, if you let it.